Using aquarium salt for bettas can be both good and bad. In this article, you’ll find out how to use aquarium salt appropriately. Because when used properly it can be great medicine. However, when used wrong it can become very dangerous for your betta. 1 What Is Aquarium Salt? 2 Can You Add Aquarium Salt To Your Betta Tank? 3 Is Aquarium Salt Safe For Bettas? 4 How Often Should You Dose Your Tank With Aquarium Salt? 6 What Are Some Of The Diseases Salt Can Cure? 7 Will Aquarium Salt Raise The pH Of Your Tank? 8 What Are The Benefits Of Aquarium Salt? 9 Can You Use Regular Salt? Aquarium salt has the same chemical make up as regular salt. Both of them have the same chemical formula, NaCl. which is a 1:1 ratio of sodium and chloride. However, where aquarium salt differs is the fact it doesn’t have any additives. The salt comes from evaporated sea water, and that’s it. Can You Add Aquarium Salt To Your Betta Tank? Although you can add aquarium salt to your betta tank, it’s not always recommended. If your betta is housed alone then it will be fine. However, you should avoid adding aquarium salt to your tank if it contains any of the following. You should avoid using aquarium salt in your tank if it contains scaleless fish. Salt will dry out the slime coat on a scaleless fish, which is bad news. The slime coat on scaleless fish helps protect them from external infections. When they lose their slime coat, not only are they going to be prone to external infections, but they’ll also have a weakened immune system as well. You should also avoid using aquarium salt in your betta tank if you have live plants. Some of the more fragile plants won’t be able to handle the salinity. However, you may be able to get away with adding aquarium salt with plants such as Java Fern, Java Moss, Anacharis and Anubias. But you should always be cautious, and it’s generally better to avoid adding aquarium salt altogether. If you want to medicate your betta with aquarium salt it’s always best to do so in a quarantine tank. Is Aquarium Salt Safe For Bettas? As long as you’re not overdosing your tank, then aquarium salt is perfectly safe for bettas. While some people use aquarium salt to treat mild illnesses, other people add it to their tank as a general preventative. However, it’s important to remember that bettas don’t need aquarium salt. How Often Should You Dose Your Tank With Aquarium Salt? Before dosing your tank with aquarium salt, it’s always important to ask a professional their advice. However, as a general rule of thumb, this is how I dose my tank. Use 1 tablespoon of salt for every 5 gallons of water in your tank. Never add aquarium salt directly to your tank. Instead, place a small amount of tank water into a container and dilute the salt before adding it to your tank. Once you’ve added salt to your betta tank you should watch it for 24 hours and look for improvement. Dose your water like this for 4 days or until your betta seems well again. After the 4th day perform a 25% water change. As well as dosing your tank with salt, you can also give your betta a salt bath. This allows you to add your betta to a much more concentrated dose of salt. However, you’ll only keep them in there for a fraction of the time for their safety. To perform a salt bath make sure you have everything set up beforehand so you don’t have to waste time later on. As time is going to be of the essence. The second container should contain 1/4 of the amount of salt and one gallon of water. You’re going to use this second station as a reviving station. Here your betta will be less shocked when he gets put back into his aquarium. Once you’ve done that here are the steps you should follow. Add pretreated water to both containers. If you can use aquarium water even better. In one container add 1 tablespoon of salt and 1 gallon of water. In the second add a 1/4 of a tablespoon of salt and a gallon of water. Once you’ve done this heat the water up to 78°F, or as close as you can get it. As long as it’s between 76-80°F it will be fine. Once you’ve warmed up both containers, remove your betta from his tank and add him to a plastic bag. Once he’s in the bag float him in the first container for 10-15 minutes, before letting him into the container. Doing this will give him time to adjust. Once your betta is in the salt bath allow him to swim in it for 5-8 minutes. It should only be 8 minutes if what he’s suffering from isn’t mild. When 5-8 minutes have passed transfer your betta to the second container. This container is going to act as a halfway point for your salt bath and aquarium so your betta doesn’t get shocked entering the aquarium. Once your betta has been in the second container for 5 minutes, add him to a bag and float him on top of your aquarium water until he’s adjusted to the temperature. And the finally add him back into the aquarium. Make sure that you’re paying close attention to your betta when you’re giving him a salt bath. Oftentimes it’s not uncommon for the sudden change in salinity to knock your betta out. If it seems like he’s not breathing or if he’s laying on his side, then you should remove him from the salt bath immediately and add him back to his main tank. What Are Some Of The Diseases Salt Can Cure? Salt can often be used as a medication for many mild diseases. If your betta has any of the following then you should definitely consider treating them with salt before going onto stronger medications. Will Aquarium Salt Raise The pH Of Your Tank? Before you add anything new into your tank you need to make sure it won’t change the water parameters. Or if it’s going to, what you can do to neutralize any negative effects. You’ll be pleased to know that aquarium salt isn’t going to react with the water in your tank. Instead, the two separate components of salt, sodium, and chloride, become soluble in the water. This means that the hydrogen and oxygen molecules that make up your tank aren’t going to be altered by the addition of salt. So because no reaction is taking place, it means that there won’t be any change in the pH of your tank, just the salinity. What Are The Benefits Of Aquarium Salt? While there are mixed opinions on adding salt to your betta tank as a preventative, there is some evidence to suggest that it can be effective. In fact, the IBC (international betta congress) even recommended consistently dosing your tank with salt. A lot of the parasites that will make your betta sick, don’t survive well in salty conditions. In fact, regularly dosing your tank with aquarium salt is going to make it harder for them to reproduce or infect your betta. As well as reducing the number of parasites in the water, aquarium salt is also going to reduce the levels of nitrate and nitrite as well. When aquarium salt is added to a tank it prevents methemoglobinemia. The slime coat of a fish is very important in keeping them healthy. It makes it harder for external parasites, fungus, and bacteria to latch onto your betta and infect them. Having a strong slime coat is especially important if your betta is injured. Without a slime coat, torn fins can quickly become infected. 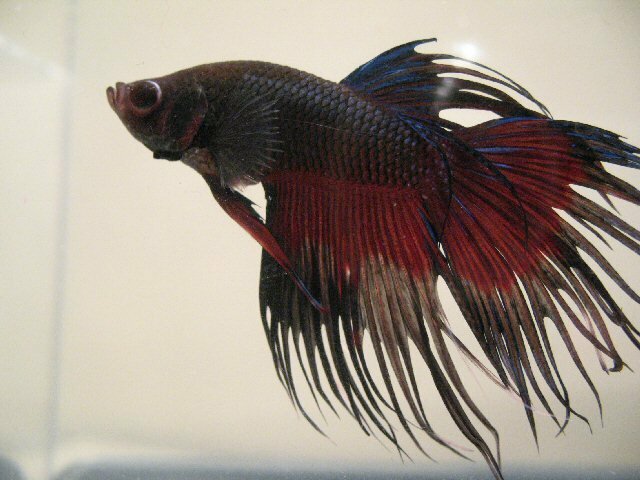 And depending on the type of betta you have torn fins can be extremely common. And lastly, aquarium salt is also going to aid gill and kidney function in your betta. 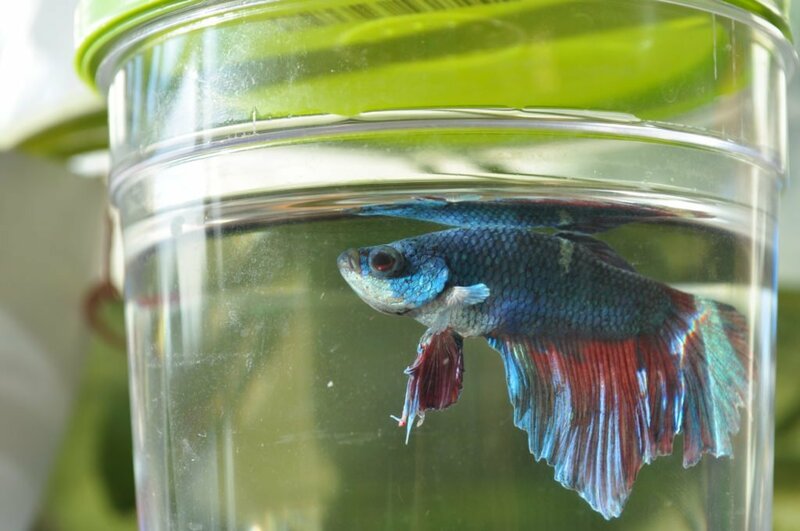 One of the main tasks of your bettas kidneys is to remove water from his body. When you add salt to your betta tank, then the amount of water your betta will absorb is reduced, putting less pressure on his gills and kidneys! Can You Use Regular Salt? You may think you can just use regular salt instead of worrying about buying aquarium salt. However, this should be avoided at all costs. Regular salt has additives in it which are going to be harmful or even lethal to your betta. You should also avoid using marine salt, which once again, has different additives in it that can be harmful to your betta. For the sake of this article stick to aquarium salt if you want your betta to stay healthy. Is Aquarium Salt The Same As Table Salt? Chemically aquarium salt and table salt are the same. But you should never use table salt in your aquarium. The difference lies in the fact that table salt has flavorings, coloring and artificial additives where aquarium salt doesn’t. Using table salt could affect the quality of the water in your tank as well as the pH level. And on top of this table salt won’t reload natural electrolytes in the water, whereas AQ salt does. In conclusion, aquarium salt is a great medication for your betta, and addition to your tank if you want it to be. In fact, aquarium salt is so good it’s a staple of any good betta first aid kit! If you don’t have a betta first aid kit then check out this article. If you have any other questions you can leave them below, otherwise, have a great day! Do Betta Fish Have Teeth And Can They Bite?